PETALING JAYA: Fifa have slapped the FA of Malaysia (FAM) with fines amounting to RM15,820 in relation to the pre-World Cup round two return-leg match between Malaysia and Singapore at National Stadium in Bukit Jalil on July 28. This was confirmed by the world body in a statement to Mailsport yesterday. The email was signed by the media department. FAM received a letter from Fifa disciplinary committee deputy-secretary Wilma Ritter earlier this month after the match commissioner’s report revealed fans threw water bottles onto the pitch, flares were lit and laser lights were beamed at Singapore goalkeeper Izwan Mahbud. FAM responded to Ritter’s letter and admitted to the security flaws seen in the match. Fifa then confirmed the committee will deliberate on the match in their meeting last week as revealed in Mailsport in an article off From the sidelines column titled FAM clueless published on Sept 7. Mailsport had, in an earlier article Walking on a tightrope published Aug 8, revealed the match could have breached several regulations of the Fifa Disciplinary Code. A fan, Ahmad Jazimin Jalaluddin, was blinded in the right eye after being struck by firecracker fragments during the match. The match ended in a 1-1 draw but Singapore advanced to the next round after earning a 6-4 aggregate. 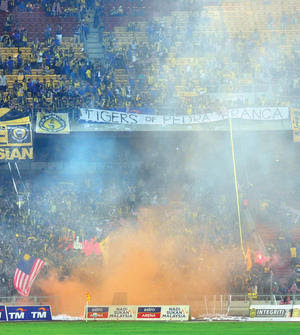 Kalau tengok article to seolah2 Ultras Malaya lah paling bersalah dalam hal ni. Yelaa letak gambo tu pulak. Tapi jangan lupa, pembaling botol, orang yang men mercun n laser pun penyumbang ke arah denda ini.. Huhuhuuu kesian FAM.